Concerned citizens have been warning that new electronic voting technology being rolled out nationwide can be used to steal elections. Now there is proof. When the State of Maryland hired a computer security firm to test its new machines, these paid hackers had little trouble casting multiple votes and taking over the machines' vote-recording mechanisms. The Maryland study shows convincingly that more security is needed for electronic voting, starting with voter-verified paper trails. When Maryland decided to buy 16,000 AccuVote-TS voting machines, there was considerable opposition. Critics charged that the new touch-screen machines, which do not create a paper record of votes cast, were vulnerable to vote theft. The state commissioned a staged attack on the machines, in which computer-security experts would try to foil the safeguards and interfere with an election. They were disturbingly successful. It was an "easy matter," they reported, to reprogram the access cards used by voters and vote multiple times. They were able to attach a keyboard to a voting terminal and change its vote count. And by exploiting a software flaw and using a modem, they were able to change votes from a remote location. Critics of new voting technology are often accused of being alarmist, but this state-sponsored study contains vulnerabilities that seem almost too bad to be true. Maryland's 16,000 machines all have identical locks on two sensitive mechanisms, which can be opened by any one of 32,000 keys. The security team had no trouble making duplicates of the keys at local hardware stores, although that proved unnecessary since one team member picked the lock in "approximately 10 seconds." Diebold, the machines' manufacturer, rushed to issue a self-congratulatory press release with the headline "Maryland Security Study Validates Diebold Election Systems Equipment for March Primary." The study's authors were shocked to see their findings spun so positively. Their report said that if flaws they identified were fixed, the machines could be used in Maryland's March 2 primary. But in the long run, they said, an extensive overhaul of the machines and at least a limited paper trail are necessary. The Maryland study confirms concerns about electronic voting that are rapidly accumulating from actual elections. In Boone County, Ind., last fall, in a particularly colorful example of unreliability, an electronic system initially recorded more than 144,000 votes in an election with fewer than 19,000 registered voters, County Clerk Lisa Garofolo said. Given the growing body of evidence, it is clear that electronic voting machines cannot be trusted until more safeguards are in place. Unfortunately this was the best way they could think for the US troops in Iraq to vote in the elections. They are probably not going to do it because of security concerns. Does anyone know if the troops will still be able to vote somehow? The creator of the site, and various other liberal activists sites, got sued by Diebold for releasing an internal memo exposing their voting machines weaknesses. Diebold claimed that publishing the memo was unfair use of their material without their consent (copyright violation). IT'S NOT RIGHT THAT THEY USE OUR FAULTY DESIGNS FOR THEIR PROFIT!!!! Insecure voting machines undermine every American's faith in our democracy. Immediate action must be taken to prevent a repeat of the 2000 presidential election. But simply requiring a voter-verified paper trail on electronic voting machines is a dangerously naïve solution. If the machines are so easy to hack into, what would prevent someone from changing the software so that the machine prints out a vote for one candidate and records electronically a vote for the other? It is obvious that electronic voting machines are not yet ready for use in a national election. Technologies like the simple paper ballot have sufficed for centuries, and can do so for a few more years. Safeguarding our democracy is paramount. I, like most Americans, am not yet willing to entrust our democracy to voting machines whose security is so remarkably sub-par. I know of no better way to undermine democracy than to adopt a computerized voting system in which people have no confidence ("How to Hack an Election," editorial, Jan. 31). Let the computer industry eliminate the possibility of hacking. Then it can sell computerized voting. The same people who can steal your identity can steal your vote. Have you ever agreed to arrive at a decision by the toss of a coin? How would it be if the person doing the tossing also does the catching, slaps it on the back of his hand, and then proclaims that chance has favored him, without giving you the opportunity of seeing the proof? "Electronic voting" without a paper trail is the same thing. WASHINGTON, May 22 - A coalition of computer scientists, voter groups and state officials, led by California's secretary of state, Kevin Shelley, is trying to force the makers of electronic voting machines to equip those machines with voter-verifiable paper trails. Following the problems of the 2000 election in Florida, a number of states and hundreds of counties rushed to dump their punch card ballot systems and to buy the electronic touch screens. Election Data Services, a consulting firm that specializes in election administration, estimates that this November 50 million Americans - about 29 percent of the electorate - may be voting on touch screens, up from 12 percent in 2000. Paper trails - ballot receipts - would let voters verify that they had cast their votes as they intended and let election officials conduct recounts in close races. Not everyone agrees that paper trails are necessary, or even advisable. Numerous local election officials - the ones who actually conduct elections - argue that paper trails could create worse problems than the perceived ones that they are intended to cure. They warn of paper jams, voter confusion and delays in the voting booth while voters read their receipts. Mr. Shelley said he was requiring counties to allow voters to vote on paper if they wanted to, even if there were no apparent problems with the touch screens. "It's a voter-confidence issue," he said in an interview. "It should be a no-brainer." "People are demanding this," said Representative Rush D. Holt, a New Jersey Democrat who has introduced a bill to require that by November, all voters be able to cast ballots that they can verify. This would entail either retrofitting touch screens with printers or requiring a county to go back to a paper-based system like optical-scan equipment or even punch cards. "The Maryland primary was a very instructive learning experience for all activists," said Kim Alexander, president and founder of the California Voter Foundation, a grass-roots watchdog group in Sacramento that is helping to organize voter groups across the country. "There are movements in a lot of states, and we're sharing information," she said. She said she took it as a mark of success that 75 percent of the voting jurisdictions in the country will be using the same equipment in November as they used in 2000. "I'd rather have voters vote on punch cards than on an electronic system that can't be verified," she said. Some officials, like state Senator Teresa Fedor, Democrat of Toledo, said this made no sense. If a paper trail is so important, she asked, why should voters go through even one election without them - especially in a state where the presidential vote could be close. She successfully argued to the Legislature that Ohio counties should be able to postpone buying the machines. "There are too many concerns for us to keep a blind eye," she said. "Ohio is the big struggle state right now," said Will Doherty, executive director of VerifiedVoting.org, a group advocating for paper trails. Doug Chapin of Electionline.org, a clearinghouse for election information set up by the Pew Charitable Trust, said that Ohio was "rolling the dice" to see whether paper trails were necessary. "You can either build a fence around a cliff or put an ambulance in the valley," he said. "The paper trail is the ambulance in the valley. Certifying the machines and testing them in the first place to make sure they are secure is the fence around the cliff." This fall, as many as 20 percent of American voters will be able to cast their ballots on A.T.M.-style electronic voting machines. But to put it mildly, these machines -- where you simply touch a screen and a computer registers your vote -- have not inspired much confidence lately. North Carolina officials recently learned that a software glitch destroyed 436 e-ballots in early voting for the 2002 general election. In a Florida state election this past January, 134 votes apparently weren't recorded -- and this was in a race decided by a margin of only 12 votes. Since most of the machines don't leave any paper trail, there's no way to determine what actually happened. Most alarmingly, perhaps, California's secretary of state recently charged that Diebold -- the industry leader -- had installed uncertified voting machines and then misled state officials about it. Electronic voting has much to offer, but will we ever be able to trust these buggy machines? Yes, we will -- but only if we adopt the techniques of the ''open source'' geeks. One reason it's difficult to trust the voting software of companies like Diebold is that the source code remains a trade secret. A few federally approved software experts are allowed to examine the code and verify that it works as intended, and in some cases, states are allowed to keep a copy in escrow. But the public has no access, and this is troublesome. When the Diebold source code was accidentally posted online last year, a computer-science professor looked at it and found it was dangerously hackable. Diebold may have fixed its bugs, but since the firm won't share the code publicly, there's no way of knowing. Just trust us, the company says. But is the counting of votes -- a fundamental of democracy -- something you want to take on faith? No, this problem requires a more definitive solution: ending the secrecy around the machines. First off, the government should ditch the private-sector software makers. Then it should hire a crack team of programmers to write new code. Then -- and this is the crucial part -- it should put the source code online publicly, where anyone can critique or debug it. This honors the genius of the open-source movement. If you show something to a large enough group of critics, they'll notice (and find a way to remove) almost any possible flaw. If tens of thousands of programmers are scrutinizing the country's voting software, it's highly unlikely a serious bug will go uncaught. The government's programming team would then take the recommendations, incorporate them into an improved code and put that online, too. This is how the famous programmer Linus Torvalds developed his Linux operating system, and that's precisely why it's so rock solid -- while Microsoft's secretly developed operating systems, Linux proponents say, crash far more often and are easier to hack. Already, Australians have used the open-source strategy to build voting software for a state election, and it ran like a well-oiled Chevy. A group of civic-minded programmers known as the Open Voting Consortium has written its own open-source code. But if our code were open, wouldn't cyberterrorists or other outlaws be able to locate flaws and possibly rig an election? Well, theoretically -- except that it's highly unlikely that they could spot an error that escaped thousands and thousands of scrutineers. Indeed, it may be far easier to infiltrate a private-sector company and tamper with its software. Diebold, after all, kept quiet about the bugs it found in its programs -- including one that subtracted more than 16,000 votes from Al Gore in a single Florida country during the initial vote counting in the 2000 election. Open-source enthusiasts, by contrast, are precisely the sort of people you'd like to see inspecting the voting code; they're often libertarian freaks, nuttily suspicious of centralized power, and they'd scream to the high heavens if they found anything wrong. From the classification of documents to the refusal to name detainees, the Bush administration's actions show a high regard for secrecy. In essence, it's hiding its code, too. Inside such closed systems, nasty things can happen, as we're learning to our chagrin. Perhaps a blast of open-source candor is exactly what America needs right now. Clive Thompson writes frequently for the magazine about science and technology. Whenever questions are raised about the reliability of electronic voting machines, election officials have a ready response: independent testing. There is nothing to worry about, they insist, because the software has been painstakingly reviewed by independent testing authorities to make sure it is accurate and honest, and then certified by state election officials. But this process is riddled with problems, including conflicts of interest and a disturbing lack of transparency. Voters should demand reform, and they should also keep demanding, as a growing number of Americans are, a voter-verified paper record of their vote. Experts have been warning that electronic voting in its current form cannot be trusted. There is a real danger that elections could be stolen by nefarious computer code, or that accidental errors could change an election's outcome. But state officials invariably say that the machines are tested by federally selected laboratories. The League of Women Voters, in a paper dismissing calls for voter-verified paper trails, puts its faith in "the certification and standards process." But there is, to begin with, a stunning lack of transparency surrounding this process. Voters have a right to know how voting machine testing is done. Testing companies disagree, routinely denying government officials and the public basic information. Kevin Shelley, the California secretary of state, could not get two companies testing his state's machines to answer even basic questions. One of them, Wyle Laboratories, refused to tell us anything about how it tests, or about its testers' credentials. "We don't discuss our voting machine work," said Dan Reeder, a Wyle spokesman. Although they are called independent, these labs are selected and paid by the voting machine companies, not by the government. They can come under enormous pressure to do reviews quickly, and not to find problems, which slow things down and create additional costs. Brian Phillips, president of SysTest Labs, one of three companies that review voting machines, conceded, "There's going to be the risk of a conflict of interest when you are being paid by the vendor that you are qualifying product for." It is difficult to determine what, precisely, the labs do. To ensure there are no flaws in the software, every line should be scrutinized, but it is hard to believe this is being done for voting software, which can contain more than a million lines. Dr. David Dill, a professor of computer science at Stanford University, calls it "basically an impossible task," and doubts it is occurring. In any case, he says, "there is no technology that can find all of the bugs and malicious things in software." The testing authorities are currently working off 2002 standards that computer experts say are inadequate. One glaring flaw, notes Rebecca Mercuri, a Harvard-affiliated computer scientist, is that the standards do not require examination of any commercial, off-the-shelf software used in voting machines, even though it can contain flaws that put the integrity of the whole system in doubt. A study of Maryland's voting machines earlier this year found that they used Microsoft software that lacked critical security updates, including one to stop remote attackers from taking over the machine. If so-called independent testing were as effective as its supporters claim, the certified software should work flawlessly. But there have been disturbing malfunctions. Software that will be used in Miami-Dade County, Fla., this year was found to have a troubling error: when it performed an audit of all of the votes cast, it failed to correctly match voting machines to their corresponding vote totals. If independent testing were taken seriously, there would be an absolute bar on using untested and uncertified software. But when it is expedient, manufacturers and election officials toss aside the rules without telling the voters. In California, a state audit found that voters in 17 counties cast votes last fall on machines with uncertified software. When Georgia's new voting machines were not working weeks before the 2002 election, uncertified software that was not approved by any laboratory was added to every machine in the state. Truly independent laboratories. Government, not the voting machine companies, must pay for the testing and oversee it. Transparency. Voters should be told how testing is being done, and the testers' qualifications. Rigorous standards. These should spell out in detail how software and hardware are to be tested, and fix deficiencies computer experts have found. Tough penalties for violations. Voting machine companies and election officials who try to pass off uncertified software and hardware as certified should face civil and criminal penalties. Mandatory backups. Since it is extremely difficult to know that electronic voting machines will be certified and functional on Election Day, election officials should be required to have a nonelectronic system available for use. None of these are substitutes for the best protection of all: a voter-verified paper record, either a printed receipt that voters can see (but not take with them) for touch-screen machines, or the ballot itself for optical scan machines. These create a hard record of people's votes that can be compared to the machine totals to make sure the counts are honest. It is unlikely testing and certification will ever be a complete answer to concerns about electronic voting, but they certainly are not now. If election officials want to convince voters that electronic voting can be trusted, they should be willing to make it at least as secure as slot machines. To appreciate how poor the oversight on voting systems is, it's useful to look at the way Nevada systematically ensures that electronic gambling machines in Las Vegas operate honestly and accurately. Electronic voting, by comparison, is rife with lax procedures, security risks and conflicts of interest. When it comes to voting machine manufacturers, all a company needs to do to enter the field is persuade an election official to buy its equipment. There is no way for voters to know that the software on their machines was not written by programmers with fraud convictions, or close ties to political parties or candidates. 5. The lab that certifies gambling equipment has an arms-length relationship with the manufacturers it polices, and is open to inquiries from the public. The Nevada Gaming Control Board lab is a state agency, whose employees are paid by the taxpayers. The fees the lab takes in go to the state's general fund. It invites members of the public who have questions about its work to call or e-mail. The federal labs that certify voting equipment are profit-making companies. They are chosen and paid by voting machine companies, a glaring conflict of interest. The voters and their elected representatives have no way of knowing how the testing is done, or that the manufacturers are not applying undue pressure to have flawed equipment approved. Wyle Laboratories, one of the largest testers of voting machines, does not answer questions about its voting machine work. 6. When there is a dispute about a machine, a gambler has a right to an immediate investigation. When a gambler believes a slot machine has cheated him, the casino is required to contact the Gaming Control Board, which has investigators on call around the clock. Investigators can open up machines to inspect their internal workings, and their records of recent gambling outcomes. If voters believe a voting machine has manipulated their votes, in most cases their only recourse is to call a board of elections number, which may well be busy, to lodge a complaint that may or may not be investigated. Election officials say their electronic voting systems are the very best. But the truth is, gamblers are getting the best technology, and voters are being given systems that are cheap and untrustworthy by comparison. There are many questions yet to be resolved about electronic voting, but one thing is clear: a vote for president should be at least as secure as a 25-cent bet in Las Vegas. This November, millions of voters will use electronic voting machines of questionable reliability. The election is by now too near for the sort of major overhaul that electronic voting requires. But there is still time for states and localities to protect the integrity of the voting and build public confidence in the results. The public should insist that election officials put these protections in place right away. There has been extensive documentation of the problems with electronic voting. Several studies have found that it is vulnerable to vote theft and to inadvertent errors that can alter the outcome of an election. These inherent flaws are made worse by the reckless, and possibly illegal, actions of voting machine companies. This spring, California banned 14,000 Diebold voting machines because of allegations of "fraudulent actions" by the manufacturer. In a well-run election system, electronic voting machines costing millions of dollars would not have been purchased before there were adequate standards for ensuring that they work properly. But given that nearly one-third of voters may be voting electronically this fall, it is fortunate that a number of private groups - including the Brennan Center for Justice at the New York University Law School and the Caltech/M.I.T. Voting Technology Project - have stepped forward with ideas for how election officials can minimize the risks. Kevin Shelley, the California secretary of state and a pioneer in the field, has also issued useful directives, many of which are on his official Web site. Physical security for electronic systems Electronic voting machines must be kept secure at all times. It seems like an obvious point, but it's been ignored too often. In Georgia's March primary, voting machines were reported to have been delivered early to a polling place in a university student center, and left unattended. Some places start up machines the night before the election, a clear security risk. The locks and antitampering devices on machines must be more secure. A study earlier this year in Maryland found, unbelievably, that all 16,000 electronic voting machines in the state had identical locks, which could be opened with a single key. The entire "chain of custody" of the voting, from the casting of ballots to the final tabulation, must be kept secure. Computers used in elections must not be used for anything else. All software used on them should be certified, and logs should be kept of everyone who has access to them. Rigorous testing of electronic machines In many jurisdictions, testing is woefully inadequate. The machines should be exhaustively tested in advance, with real people casting votes, not simply machines "self-testing" their accuracy. The tests should use all of the ballot configurations that will be used in the election, and in large enough sample sizes to draw meaningful conclusions. Randomly selected machines should be continually tested throughout Election Day. This "parallel monitoring," as it is known, can test parts of the system that come into play only during actual voting. It can ensure that no malicious software was installed that was designed to look honest before and after voting, but to steal votes during the election itself. Properly trained poll workers, and rapid-response teams on Election Day Many of the problems that have occurred so far with electronic voting were due to election workers' errors. Poll workers must be extensively trained in the use of electronic voting machines, and given clearly written materials. On Election Day, there should be enough technology experts available to handle problems as they occur, monitoring teams doing spot checks for malfunctions and tampering, and rapid-response teams available for quick on-site visits. Public records at the precinct level The more records that are created of vote totals, and the earlier in the process such records are created, the harder it is to steal votes. When the polls close, the results should be printed out and posted at each precinct and should remain there for at least one day to protect against alterations in the totals during transmission to the central office. Election results for precincts should also be immediately posted online. The option to vote non-electronically Many voters do not trust electronic voting, and many are not confident of their computer skills. Any voter should be able to use a paper ballot. A review of Florida's primary this March found that elderly voters were more likely than others to cast ballots that did not select a candidate. 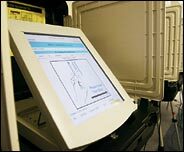 Forcing people to vote electronically could lead to a rerun of the infamous "butterfly ballot" of 2000, with overly complicated voting technology that disenfranchises voters. Independent security experts The short history of electronic voting has shown that manufacturers cannot be trusted when it comes to the reliability of their products. Jurisdictions that use electronic voting should employ outside experts to test their systems. These tests should be done well in advance and made public. Voters should be told what is being done to address any problems. Transparency in electronic voting As we saw again this month in Florida, which was forced to scrap a flawed list of felons to be purged from voter rolls that it had originally kept from the public, secrecy in election administration is often a cover for incompetence, or even partisan manipulation. Voters should be able to monitor every aspect of electronic voting, from the purchase of machines to the final tabulation of votes, and offered enough training that they can understand what they are seeing. In the long run, electronic voting should not be allowed without unimpeachable and mandatory security standards, and machines that allow voters to see paper records and ensure that their votes are properly recorded. Unfortunately, a large part of the electorate will be using electronic machines this fall that lack these safeguards. Election officials have an obligation to act now to make the system as reliable as possible. Making Votes Count: Editorials in this series remain online at www.nytimes.com/makingvotescount . In a sleek law firm conference room 19 stories above Park Avenue last Thursday night, the subject was where people wanted to go to monitor elections this week. A few hands shot up for Florida, and more for Pennsylvania. But while Florida may still be the marquee name in election mismanagement, Ohio is where most people wanted to be on Nov. 2. The most inscrutable of all the swing states, it's where the Republicans have filed objections to 35,000 new voter registrations and are sending 3,600 poll challengers, mainly to heavily minority precincts that tend to produce Democratic votes. The law students and lawyers in the Midtown law offices, volunteers for a group called Election Protection, wanted to be there, too, pushing in the opposite direction. The legacy of Florida 2000 was public knowledge of a secret that election officials had long kept to themselves: that every year millions of eligible voters are wrongly prevented from voting, and millions of votes are thrown out. Many states, including Ohio, still use punch-card machines that produce the hanging, dimpled and pregnant chads Americans expected to see eliminated after the last fiasco. Reckless voting-roll purges are still throwing eligible voters off the rolls. And this year has produced new outrages, such as Glenda Hood, the Florida secretary of state, ordering election officials to throw out voter registrations when applicants fail to check a box saying they are citizens - even though they swear they are elsewhere on the form. In the face of this government indifference and hostility to voters, private citizens have begun to step in. When Election Protection, a nonpartisan coalition of more than 50 groups, ranging from the League of Women Voters to Rock the Vote, sent out a call for volunteers, the response was overwhelming. A thousand people showed up to be trained in a single day last month at Columbia Law School. The coalition will send out 25,000 poll monitors next week to "high risk" precincts in 17 states, and operate a toll-free nationwide hot line, 1-866-OUR-VOTE, on Election Day. More voters are disenfranchised every year by incompetent or malevolent election administrators than anything else. During Florida's August primary, Election Protection monitors observed a poll worker shouting through a bullhorn that no one would be allowed to vote without photo ID, even though Florida law does not require voter ID. Anyone who has spent any time observing local voting officials at work can attest that there is enough incompetence out there to cover a multitude of disenfranchisements. Still, it's hard to avoid the conclusion that at least some of these officials are intentionally trying to stop eligible people from voting. Ohio's secretary of state recently issued an order, which he rescinded in the face of loud protests, that voter registrations submitted on insufficiently thick paper would be thrown out. Last week, Missouri's secretary of state said there was nothing wrong with groups that run registration drives throwing out registrations that they promised to hand in. Inevitably, the sight of all these eager young people piling onto buses to help people vote in other states calls up comparisons to the civil rights movement in the 1960's. If nothing else, the latest generation of voter rights advocates are identical in their enthusiasm. Last week in New York, Jon Miller, a third-year law student, was training his fellow volunteers on what to expect after they board their buses for Ohio at 9 Monday night. When they arrive the following morning, he said, they will pick up a stack of voter bills of rights, put on their You Have the Right to Vote T-shirts, and arrive at their assigned polling places by 5:30 a.m. "Even though you've just gotten off an eight-hour bus ride," he assured his charges energetically, "you are going to feel fresh and great." Making Votes Count: The editorials in this series remain online at www.nytimes.com/makingvotescount . When the last of the Ohio returns came in, the 2004 election ended up being outside the so-called margin of litigation. But an uncontested election is not necessarily a well-run one. In Ohio, and around the country, this year's election exhibited flaws that will continue to detract from our democracy until they are addressed. One of the first issues that both parties should commit to is working to produce a first-class elections system. There were significant problems with the Ohio voting, even though the Kerry campaign determined that a recount would not change the outcome. Incredibly, four years after the 2000 election mess, more than 70 percent of Ohioans still cast their vote on punch-card machines, whose hanging, pregnant and dimpled chads routinely disenfranchise as many as 2 percent, or more, of the voters who use them. Many of the more than 130,000 Ohioans who were forced to vote on provisional ballots were registered voters who should have been on the rolls. The system did not melt down, but there were plenty of problems that showed its vulnerability. Partisan poll workers challenged voters in Ohio and Florida, relying on laws that in future elections could be used to disenfranchise large numbers of voters and to slow voting in some precincts to a crawl. Voter identification requirements were arbitrarily, and often incorrectly, enforced. Minority voters in some states were the targets of dirty tricks, including leaflets telling newly registered voters that they could not vote in this year's election. One of the most troubling problems with the voting was the extraordinary lines many voters faced at the polls. In some areas, the wait to vote was four hours or more, and in many cases the longest lines were in minority neighborhoods. Many people literally cannot afford to wait that long to vote, and there were numerous reports of voters leaving the lines without voting. The nation should commit itself to providing enough voting machines and election workers to make waiting times reasonable. The controversy over provisional ballots, one of the few reforms to come out of the 2000 election, showed that the rules governing them need improvement. Many states quietly adopted laws requiring these provisional ballots to be thrown out if they are cast in the wrong precinct. But election officials are often unable to direct voters to the right precinct on Election Day. A valid ballot should count wherever it is filed. There were also too many reports of absentee ballots duly applied for, including by military personnel, that did not arrive in time. Nearly one-third of voters nationwide cast their ballots on electronic voting machines that do not produce a paper trail. As the public has learned more about the vulnerability of electronic voting to errors and intentional tampering, there has been a fast-growing movement to require voter-verified paper trails. Until these are provided, many voters will not have confidence in these machines. The good news about the election system this week is that more than 114 million Americans, including many young people and new voters, believed in it enough to vote. There is great work to be done, however, to give them the system they deserve.